We have provided organizational, logistical, advisory, financial and networking support to East Bay not-for-profit organizations for almost two decades. While often involving repair, we've been concerned more broadly with East Bay industrial arts, building, and youth from marginalized populations. In the Spring of 2017 our focus turned more fully to repair. We were involved early on in the bike repair program at The Crucible, providing organizational and financial support for its expansion into the Fuego and Pre-Apprentice Programs. Integrating youth development and technical proficiency across multiple disciplines — welding, woodworking, blacksmithing, foundry, etc. — these programs have served as a nexus of growth for hundreds of young people, many of them from the neighborhood and on scholarship. Some of the long-term youth participants have graduated to become regular faculty, profiled here. Very exciting. Neighborhood youth earn bikes to to take as their own through participation in the Earn-a-Bike program. Once they know what they're doing they return to staff community bike fix-a-thons, offering free bike repairs to neighbors. "Fuego is a youth leadership opportunity for high school students excited about deepening their technical skills, learning leadership skills, and supporting The Crucible’s youth classes." "The Crucible’s Pre-Apprentice Program teaches a broad range of industrial arts techniques, builds skills through networking opportunities and collaboration on public art projects, and provides underserved students with training and support to pursue vocational opportunities in metalworking and the arts." 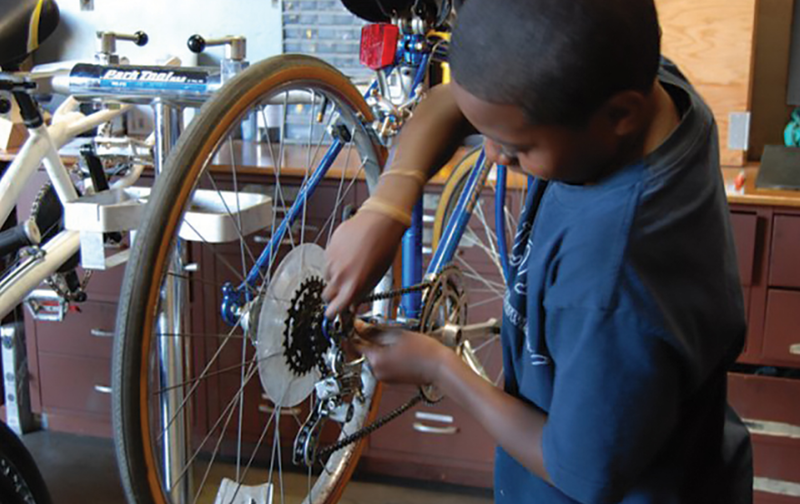 "Earn-a-Bike is designed to give West Oakland youth hands-on experience to learn about bike mechanics. In a six-week workshop, youth work with volunteer bike mechanics to fix donated bikes. Each participant fixes two bikes and keeps one. The other bike is sold to raise money to support our Bike Program." FUEGO participant grinding clean his new weld. We facilitated partnerships between The Crucible and each of Girls Inc., Oakland International High School, and Life Academy of Health and Bioscience. Some eighty students from Girls Inc. and Oakland International learned to design, cut and weld steel, producing large public art installations. Crucible Youth Program staff worked with Life Academy faculty to develop hands-on projects for integration with science and history curriculum, in alignment with state standards. "Through workshops, summer camps, collaboration with local public schools, and pre-professional training and leadership programs, youth participants gain in-depth knowledge of the creative process, the ability to bring their ideas to life, self-confidence for artistic risk-taking, and skills that can open doors for further creative and vocational exploration." OIHS: an Oakland public high school providing high quality alternative education to recently arrived immigrant students, enabling language acquisition and preparation for college. "Inspiring Girls to be STRONG through mental and physical health, SMART through academic achievement, and BOLD through leadership development." Life Academy is "a small public high school in Oakland, California.... We aim to prepare students to become future health professionals, and are committed to providing authentic learning experiences through project-based learning, field trips, and extensive internship programs focused on health and science." Working trusses on the Women's Build house, 2015 Build-a-thon, in Martinez, CA. Since 2007 the Culture of Repair Project founder has worked over 2500 hours building and repairing houses with Habitat for Humanity East Bay. "Habitat for Humanity East Bay/Silicon Valley brings people together to build homes, communities and hope. We revitalize neighborhoods, build affordable and sustainable housing solutions, and empower families through successful homeownership." Founder Emily Pilloton with a student: "Fear Less. Build More." We provided logistical and financial resources to Girls Garage, helping equip their new shop in Berkeley and supporting programs. "We inspire girls to bring their audacious ideas to life and to thrive, now and in the future. Integrating design, engineering, serious skills and social justice, our programs equip girls with the confidence and tools to build anything they can imagine and to grow alongside one another and their communities."